The Sprint colour schemes were Gold Lacquer front and rear bumpers, low gloss black wheels with stainless rimbellishers and either single (mono) colour or colour over white with Elan Sprint sidewinder decals, which were always gold. The under bonnet colour was Matt Black. Additionally, the body strip under the sills was always painted black by the factory to finish off the car. 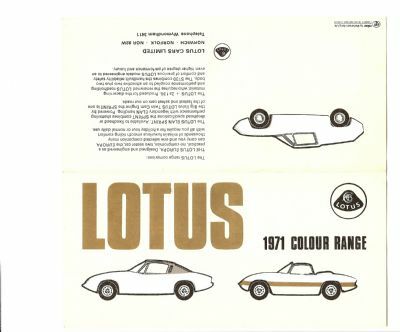 During the entire Elan production Lotus tried a series of new and experimental paint finishes; sometimes complete cars were painted in batches by outside contractors and sometimes cars were sold to dealers in primer, which allowed dealers to offer custom colours. Lotus would spray a car any colour the owner fancied. So the standard colours on the Sprint were drawn from the following list, though I acknowledge other colours were used on the S4/Sprints too. 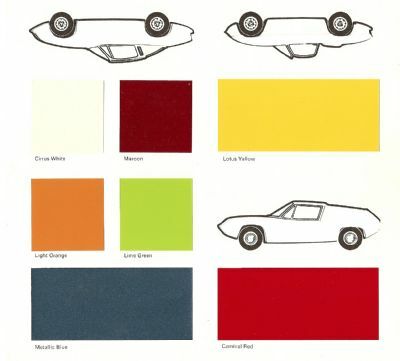 Please see here for a full list of colours used by Lotus on Elans and Plus 2s from 1962 to 1974. It includes some modern currently available equivalent paint codes. Lotus ‘L’ prefix codes indicate nitro-cellulose paint used on the Elan. At the time there were two suppliers to the factory, Pinchin, Johnson and ICI. Pinchin, Johnson was taken over by Courtaulds and merged into their paints division when they bought International Paint. ICI was taken over by Nexa Autocolor.